GSMArena team, 14 January 2019. Vivo is no stranger to experimentation. In fact, looking at the admirably broad lineup of the BBK Electronics Corporation, it quickly becomes apparent that brands like OnePlus, Oppo and more recently Realme are where you turn to for competitive device offers across the flagship, mid-range and budget market segments. Vivo, on the other hand has a certain experimental history and spirit to it. And nothing really embodies that better than the "NEX" family of devices. Now with another flashy and intriguing member in its ranks. The NEX Dual Display is nothing short of original, yet still surprisingly easy to understand on a conceptual level. In more ways than one, it is the sum of vivo's pre-existing efforts in coining a fresh new and more functional mobile design. One that clearly stems from the desire to maximize screen real estate and solve the selfie camera and sensor issue in a more elegant, notch-free manner. Screen: 6.39" Super AMOLED; 19.5:9 aspect ratio, Full HD+ (2340 x 1080 px), 403ppi. Secondary screen: 5.49" Super AMOLED, 16:9 aspect ratio, Full HD (1920 x 1080 px), 401ppi. Rear cameras: Primary: 12MP (Sony IMX363, 1.4µm); f/1.79 aperture, dual-pixel PDAF; 2MP, 2.9µm, f/1.8 - for night mode; TOF 3D camera f/1.3 for depth detection. Chipset: Snapdragon 845 chipset, octa-core processor (4x2.7 GHz Kryo 385 Gold & 4x1.7 GHz Kryo 385 Silver), Adreno 630 GPU. 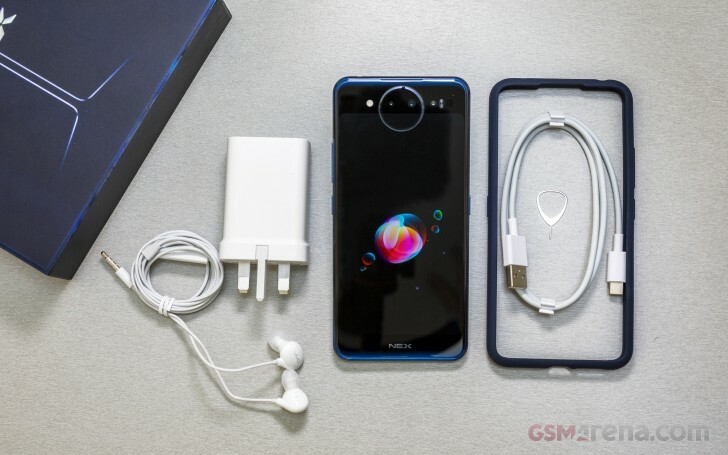 Unique and surprising, yet clearly building on a foundation and not created in isolation, the new NEX Dual Display also embraces vivo's under display fingerprint reader tech and associated space savings. Better still, it is a latest generation sensor - the same one found on the OnePlus 6T. One actually reliable and quick enough to be usable in real life, making it a marked improvement over the original NEX handset. That's actually kind of a recurring theme with the NEX Dual Display. In more ways than one, it looks exuberant and even unnecessary at first glance. Look a bit deeper, though, and most of the tech and design elements start to make sense as a next logical iteration in vivo's goal to an all-display device. That being said, though, there is no denying that the company's design and engineering teams turned the knob up to 11 and basically ripped it out for most aspects of the NEX Dual Display. This puts it squarely in experimental territory. Perhaps even gaining it a "tech showcase" status. But just because the NEX DD is unlikely to end up in many user's hands doesn't really make it any less interesting. Tag along on the following pages to see just how useful vivo's take on a second full-featured display really is. First, however, let's take a quick look at the retail package and its contents. The vivo NEX Dual Display comes in a nice two-piece box, which also incorporates a bottom sliding compartment. It is definitely above average in quality and presentation, but far from the most lavish packaging, we have seen out there. Mind you, this is a good thing in our book since overpaying for a box is generally a waste of money at the end of the day. The phone has its own cradle and is decently protected for shipping, so no complaints. As far as accessories go, vivo has included a pair of decent-feeling and nice looking earbuds. These do have an in-line microphone, so technically it's a nice hands-free unit. Also in the box - a very thick bumper case, color-coded with your unit. So, it will either be in blue or red. Likely the former, since red is strictly limited to China at the moment and even harder to get. As you can probably imagine the bumper looks quite weird. 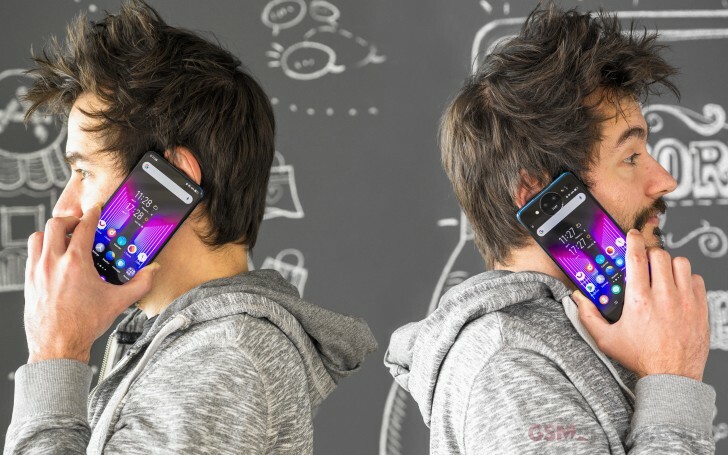 It merely covers the bezel of the phone, doing its best to extend some thickness to spill over the sides and protect the pair of displays when the phone is left on a surface. Since vivo was not about to cover the star attraction here - the second display, the back of the case is just as open as the front.